Phased construction to create new platforms for HS2 phase one trains by 2026 with phase two capacity delivered by 2033 under “flexible” design to dovetail with Network Rail’s - so far undisclosed - Euston redevelopment masterplan. Work to revamp London’s Euston Station as the terminus for the High Speed 2 have been revised by the project in a bid to minimise disruption to the existing train services and maximise the efficiency of the station capacity throughout construction. 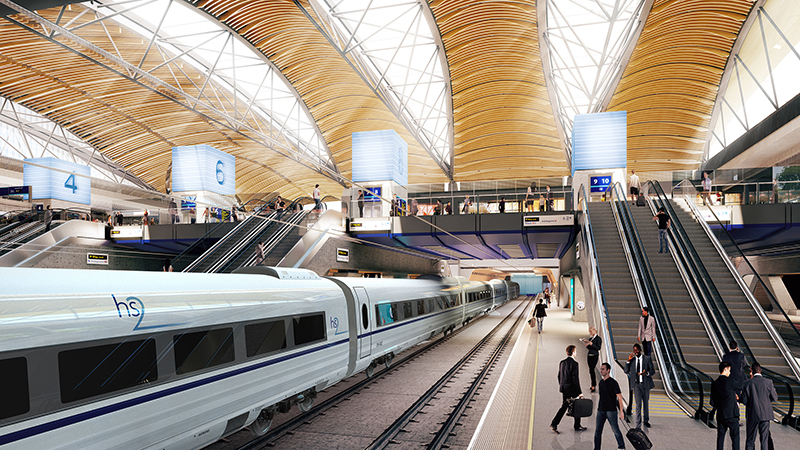 The new plan will see the station developed by HS2 project in two phases rather than one, with six new HS2 phase one platforms constructed on a redeveloped site to the west of the existing station by 2026 ahead of further work to complete the station redevelopment and provide capacity for HS2 phase two. 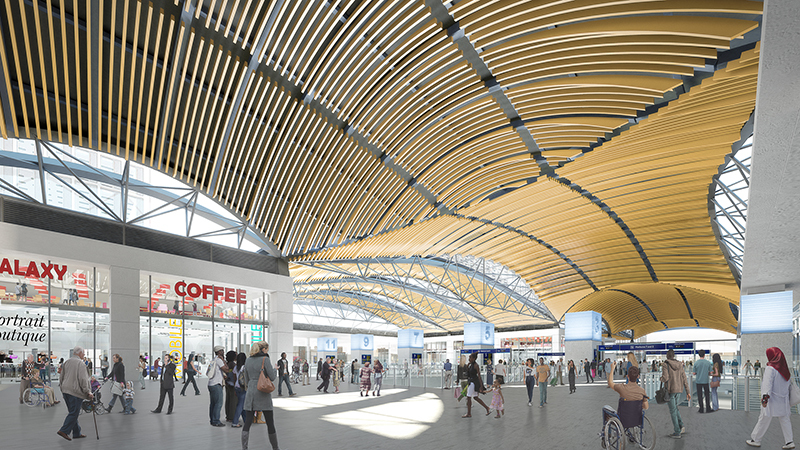 However, presenting the new scheme, HS2 Euston development director Rupert Walker accepted that the plans beyond 2026 had to remain “flexible” to accommodate Network Rail’s future - and so far undisclosed - Euston Station revamp plans, so could well change in the future. “We have redesigned the project from the bottom up and central to that is to provide value for money,” he said, pointing out that the £2.25bn cost included everything required for the HS2 scheme terminus but does not include the cost of Network Rail’s plans to redevelop the wider Euston Station complex. 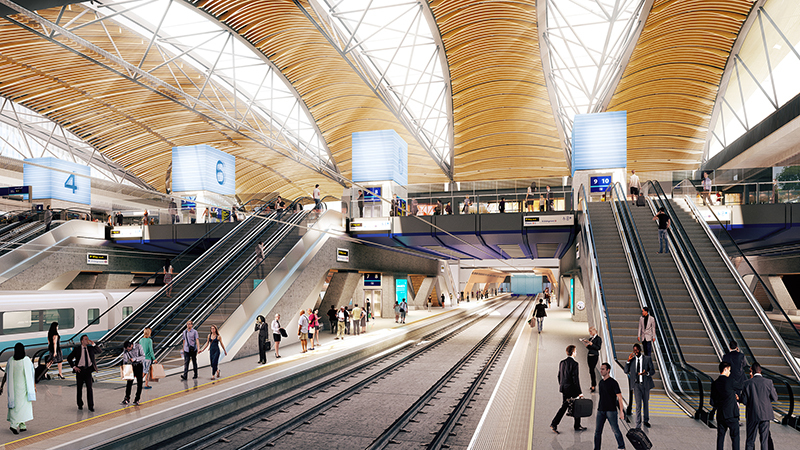 The revised HS2 plans, developed by Arup with architect Grimshaw and Partners, will see six new platforms created in what will effectively be a stand-alone station built alongside the existing facility by 2026. The first phase platforms will be at a lower level with the concourse at ground level and although it would require very little additional land take over the existing plan, the construction would keep disruption to existing station and services at a minimum. The new scheme would, Walker said, mean that the existing station capacity would only be affected after the new HS2 phase one services commenced and the West Coast Mainline timetable was amended. However, the revisions will still see the same impact on the local community with the same number of homes and businesses affected and with work – albeit less intense – now stretching over 13 years to 2033 rather than being complete by 2026. The revisions will be deposited in Parliament on 17 September as an Additional Provision to the Hybrid Bill now going through the committee stage of scrutiny in Parliament. The plans will be subject to a petitioning process that will open on 25 September and close on 23 October. It is expected that this new design will not alter the process and that the existing timetable to start construction by 2020 remained. He said the new plans better meet the project objectives fort the station by maximising value for money, create a modern transport hub, maximise benefits of the new infrastructure, minimise disruption and enable a long term vision for the area. As well as the 11 high speed platforms provided by the new plan, 11 platforms will remain in the current station to serve the existing network. There will be new public spaces for shops, restaurants and cafes. However, Walker pointed out that as redevelopment of the whole Euston site was Network Rail’s responsibility it was not possible at present to precisely say that these future plans would not change. The second phase of the work to create the five platforms required for HS2 phase 2 services, while fully designed in this scheme, he said, remained “flexible” so as to be able to accommodate Network Rail’s future plans for the station. The new scheme, explained Walker, would cost around £2.25bn compared to the £2bn estimated in the current Bill scheme. Euston opened in 1837. It now caters for around 42 million passengers a year – more than double the design capacity of the current station which was built in 1968.